November 18,2011 EIA-Geothermal is one of the main renewable energy sources used to generate U.S. electricity, even though its growth has not been as strong as wind and solar over the last three years during a big push to increase generation from renewables. Geothermal energy's greatest growth potential is in the western states (see map above). U.S. geothermal net electricity generation totaled 10,898 million kilowatthours (kWh) during the first eight months of 2011, up 10% from the same period in 2008, according to the latest data from EIA's Electric Power Monthly report. The data in the report reflects power generation facilities of 1 megawatt or larger. Geothermal energy also provides heating and cooling for three million Americans. Compared to all generating sources, geothermal produced just 0.4% of electricity from all sectors nationally during the first eight months of this year. 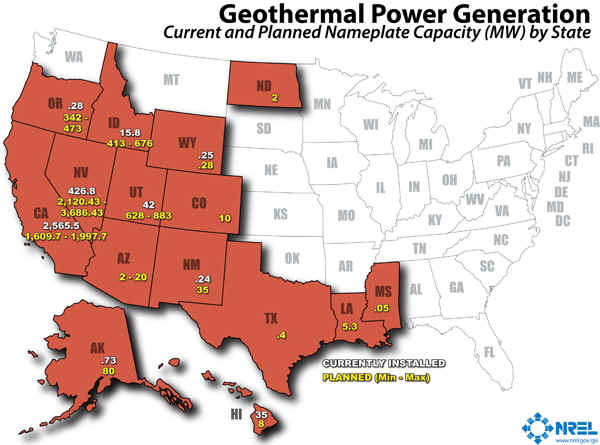 However, most geothermal power plants are located in the western states (see map below) with California producing the most electricity from geothermal, about 5% of the state's total power generation. Technology costs. New technology, referred to as enhanced geothermal systems (EGS), which may allow greater use of geothermal resources in other areas, is now in early-development. Current cost estimates for EGS are generally higher than those for conventional geothermal plants and other more mature renewable technologies like wind power. Location. Geothermal plants can be very site-specific, and have generally been limited to areas with accessible deposits of high temperature ground water. Transmission access. Lack of access to transmission lines, especially in western states where the geothermal resources are highest, limits growth. Completion lead times. Completing a geothermal power generating project takes four to eight years, longer than completion timelines for solar or wind. To generate electricity from geothermal resources, a well is usually drilled directly into an underground geothermal reservoir of water that can be as hot at 700 degrees Fahrenheit (371 Celsius). The trapped steam is brought to the surface to turn a turbine that produces electricity. Geothermal water is also found on the surface as hot springs or geysers, according to the Geothermal Energy Association (GEA). Ground source heat pumps move fluids through continuous pipeline loops that are buried underground at depths where the temperature does not change much, according to GEA. Heat picked up by the circulating fluid is delivered to a home or commercial building through a traditional duct system. During the summer, the pipeline loop pulls heat out of a building and returns cooler fluid to cool the building. 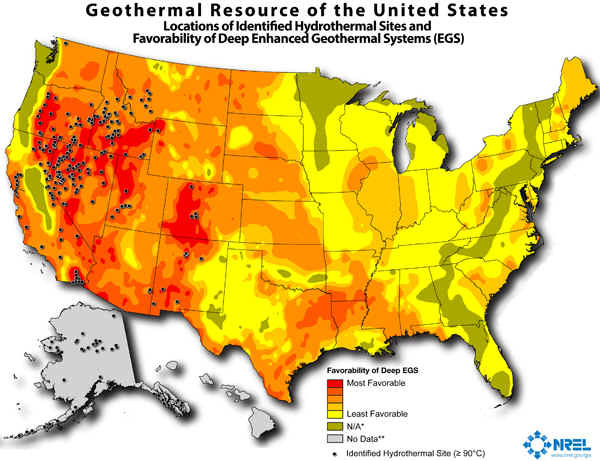 The United States has significant geothermal resources. Power generation from solar facilities of at least 1 megawatt capacity was much smaller than geothermal at 1,401 million kWh during the most recent January-August period. However, EIA data shows that generation from solar facilities over the last three years grew by 111%. Generation from distributed solar facilities smaller than 1 megawatt has also risen rapidly in recent years. Wind power increased even more at 121% to 79,186 million kWh. Coal, natural gas, and nuclear remained the three biggest power generation sources at about 43%, 24%, and 19%, respectively.